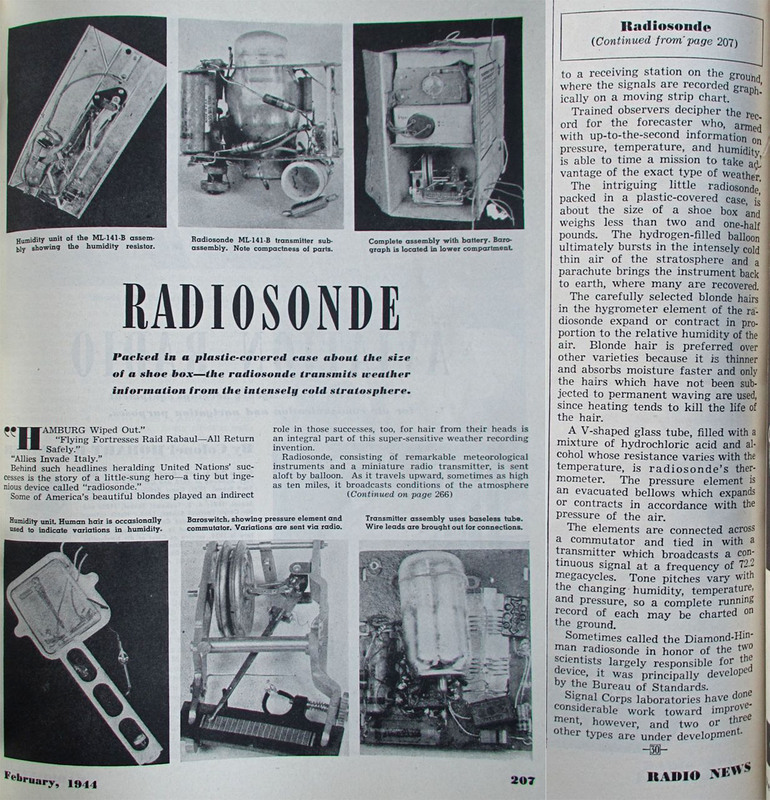 This list, arranged by date, contains citations to articles, mostly popular press, that describe or depict radiosondes (or their predecessors, meteorographs and radiometeorographs). The titles link to either a photo of the article, or part of the article, or an illustration. 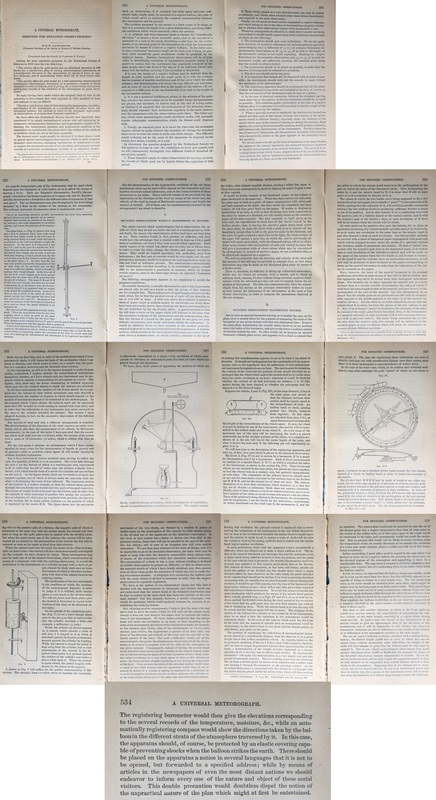 1880 Annual Report of The Board of Regents of The Smithsonian Institution For The Year Ending 1879 "A Universal Meteorograph Designed for Detached Observatories" E.H. von Baumhauer, translated from the French by Clarence B. Young 519 Proposes a balloon-borne recording meteorograph to "float freely in the atmosphere" and be returned by a finder. 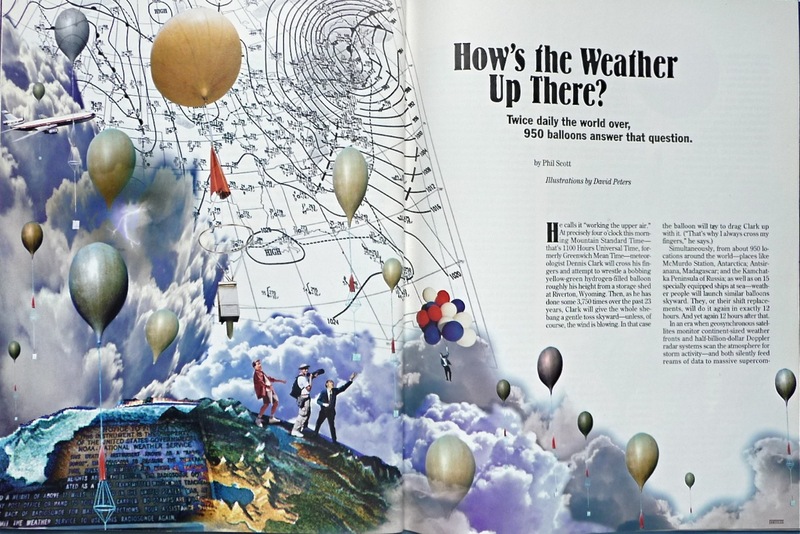 1905 June The Century Magazine “Our Heralds of Storm and Flood” Gilbert H. Grosvenor 167,168 Clipped article contains description of balloon-borne meteorographs and charming illustration by Jay Hambridge. 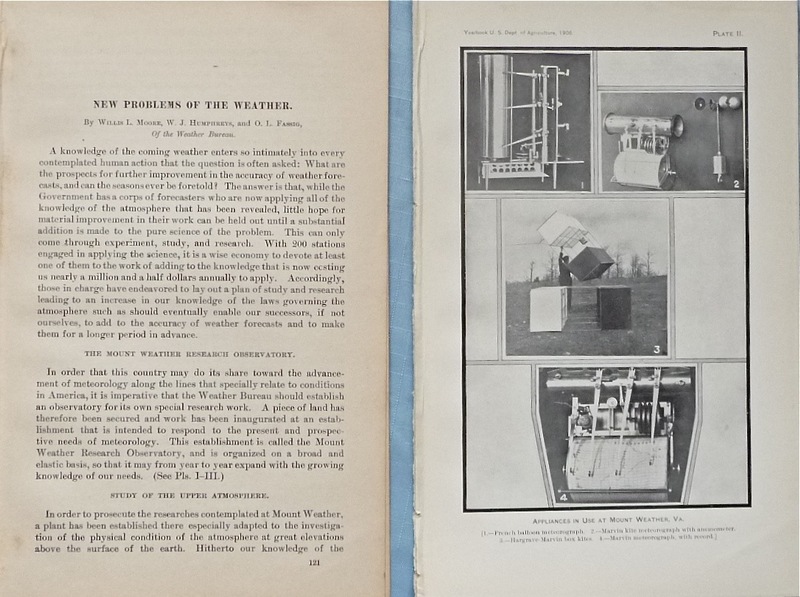 1905 March 25 The Illustrated London News “Weather Prophets: Ingenious Meteorological Instruments" 429 Meteorograph in wicker cage for aerial (kite) carriage, records temperature, pressure, humidity on smoked paper. 1906 Yearbook of the U.S. Dept. 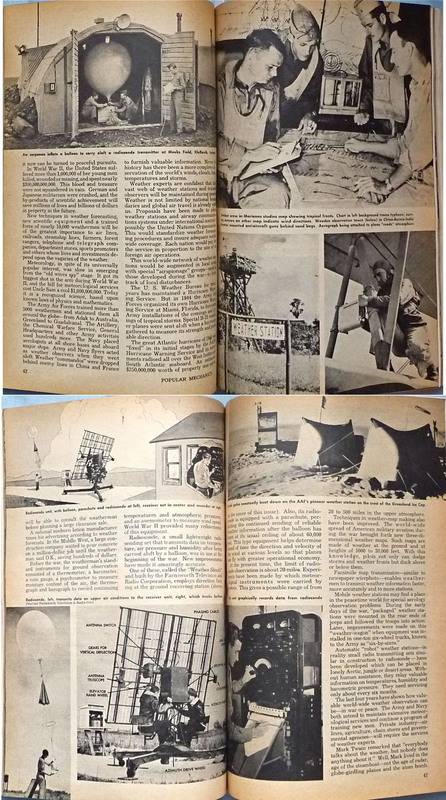 of Agriculture “New Problems of the Weather” Willis L. Moore, W. J. Humphreys, and O. L. Fassig 121 Clip of article on Mount Weather Research Station with photos of kite and balloon meteorographs. 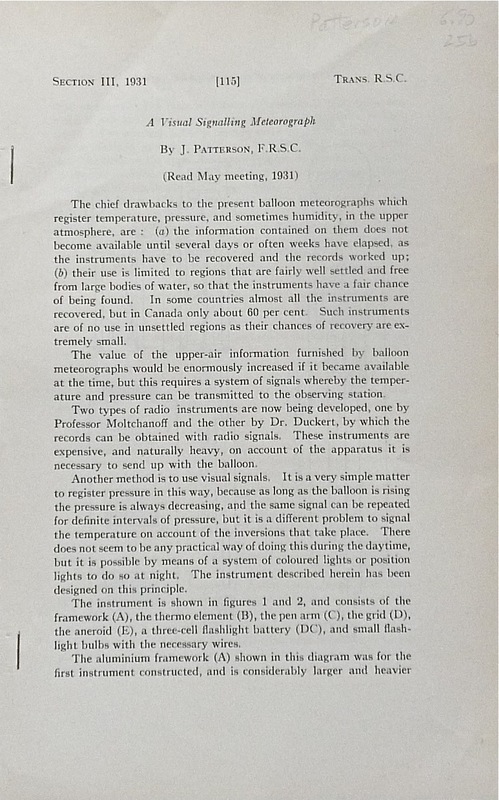 1907 Scientific American “The International Kite Ascensions” S. P. Fergusson 97-98 Mentions “successful introduction of the Ballon-sonde (or unmanned balloon carrying registering instruments only) in 1892 and shows Sterling Fergusson with a Jules Richard Meteorograph. 1907 March The Scottish Geographical Magazine “Meteorological Researches in the High Atmosphere” H.S.H. 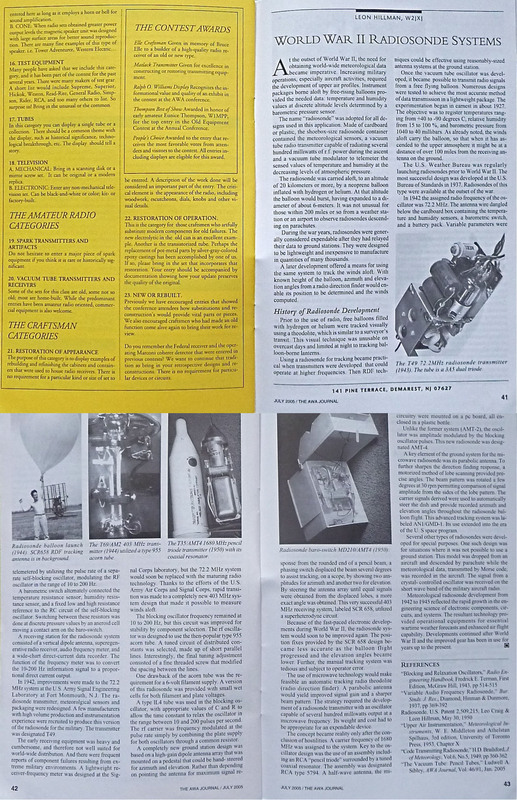 The Prince of Monaco 111 Text and photos describing balloon-meteorograph—"ballons-sondes"—launch and recovery, including a two-balloon recovery on the ocean. 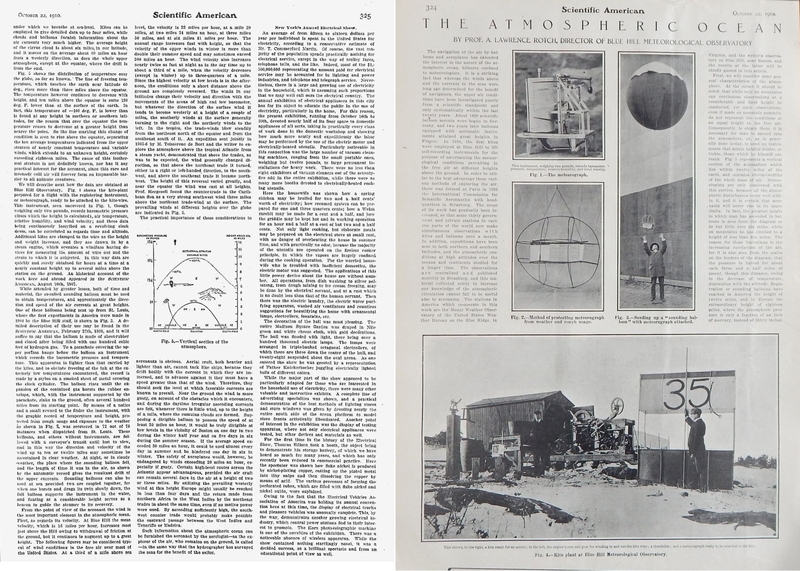 1909 November 27 Scientific American “Sounding the Ocean of Air Above Us. Atmospheric Exploration” 392 Comments on double-balloons and parachutes for meteorograph descent, history of "ballons-sondes" launches, discovery of the tropopause ("isothermal stratum") and stratosphere. 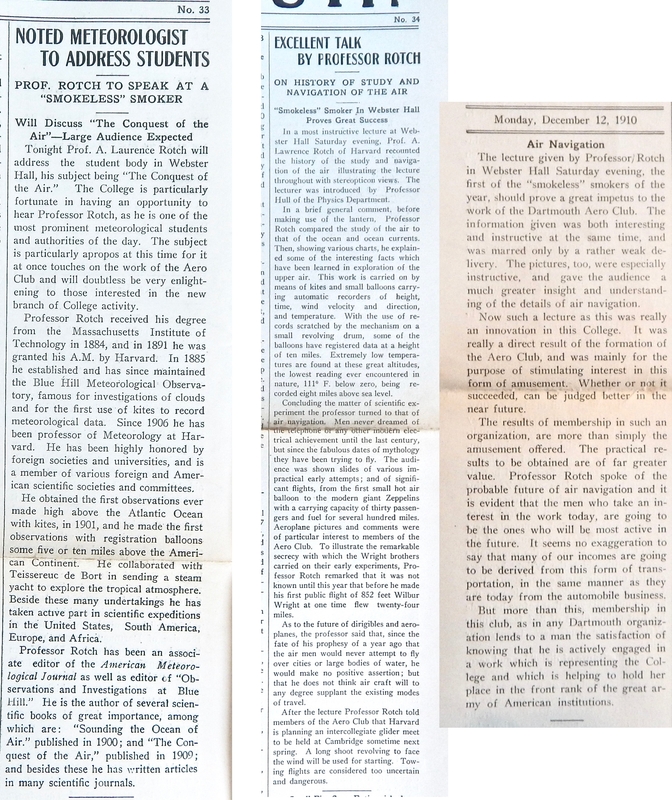 1910 December 10 & 12 The Dartmouth "Excellent Talk by Professor Rotch" 1,1 Head of Blue Hills Observatory talks of "small balloons carrying automatic recorders" as part of talk titled "The Conquest of the Air." 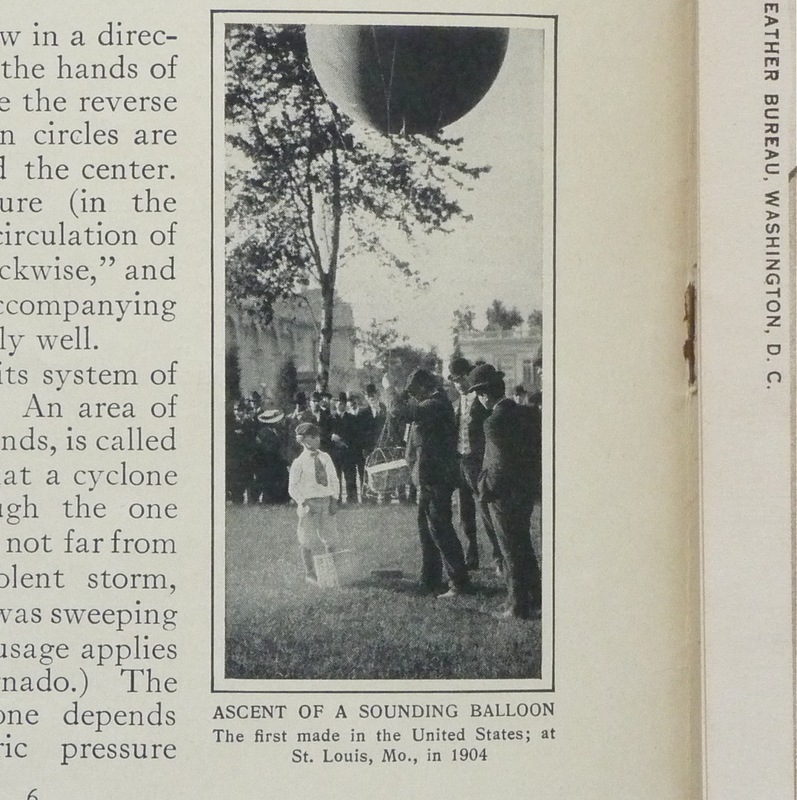 1916 July 1 The Mentor “The Weather” 6 Photo of first ascent of a meteorograph on a sounding balloon circa 1904. 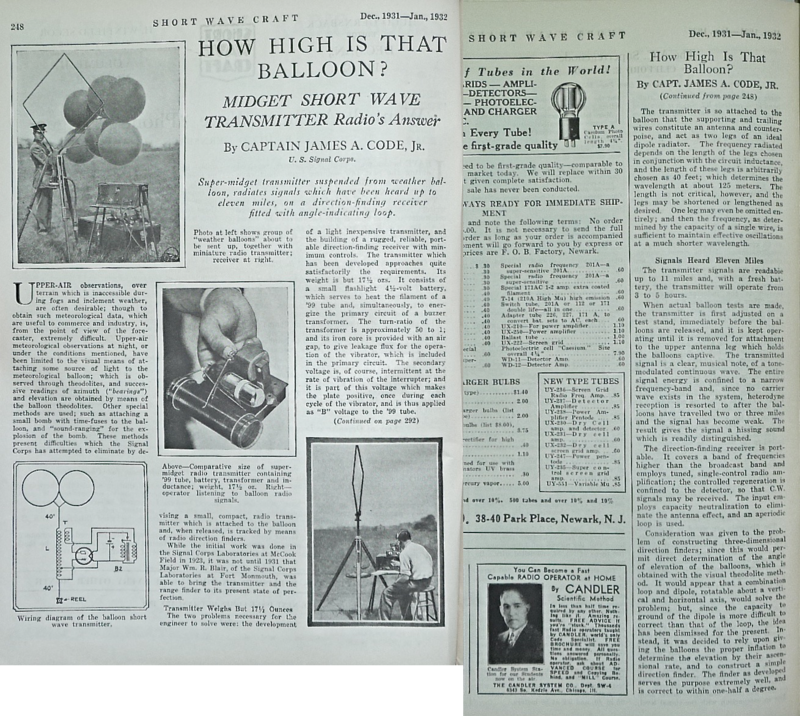 1925 December Scientific American “Exploring the Upper Air” 418 Photocopy of article with photos about balloon meteorographs. 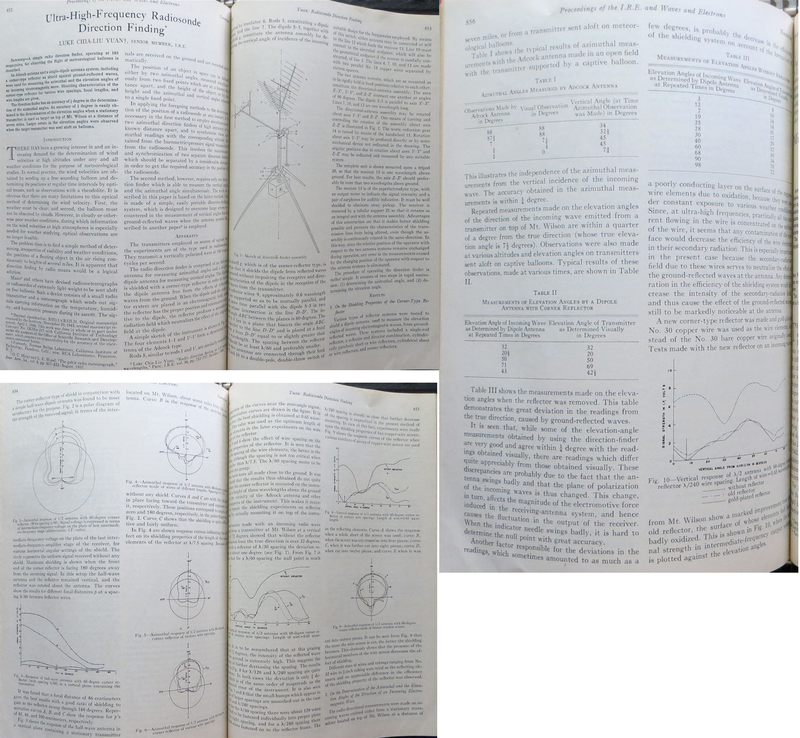 1931 May Transactions of the Royal Society of Canada “A Visual Signaling Meteorograph” J. Patterson 115 Clipped article with diagrams. 1932 January Short Wave Craft (Hugo Gersnback, ed.) “How High Is That Balloon?” Capt. J. A. Code, Jr. 248 Short-wave transmitter tracks weather balloon height, with photos. 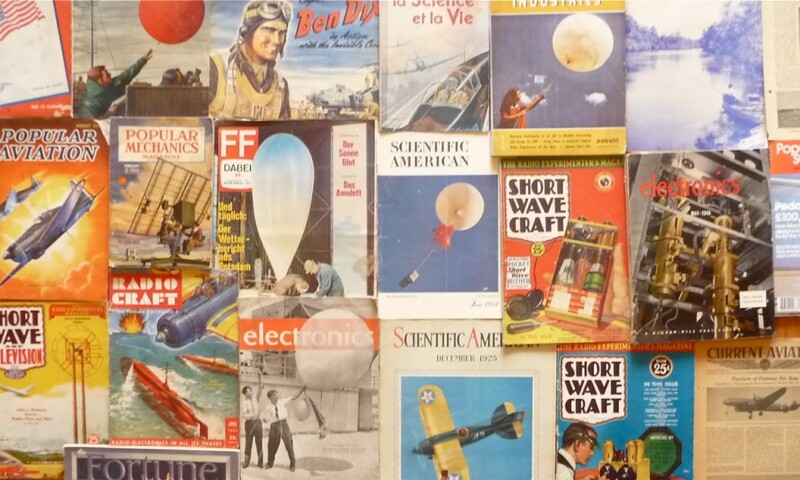 1932 July Short Wave Craft (Hugo Gernsback, ed.) 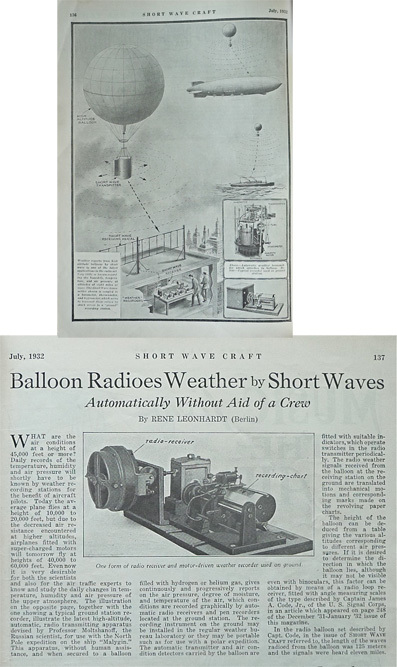 “Balloon Radioes Weather by Short Waves” Rene Leonhardt 136 Nicely illustrated brief article. 1934 August The Farmer’s Wife “Will We Get Rain?” Carroll P. Streeter 6 Photo of early radiometeorograph. 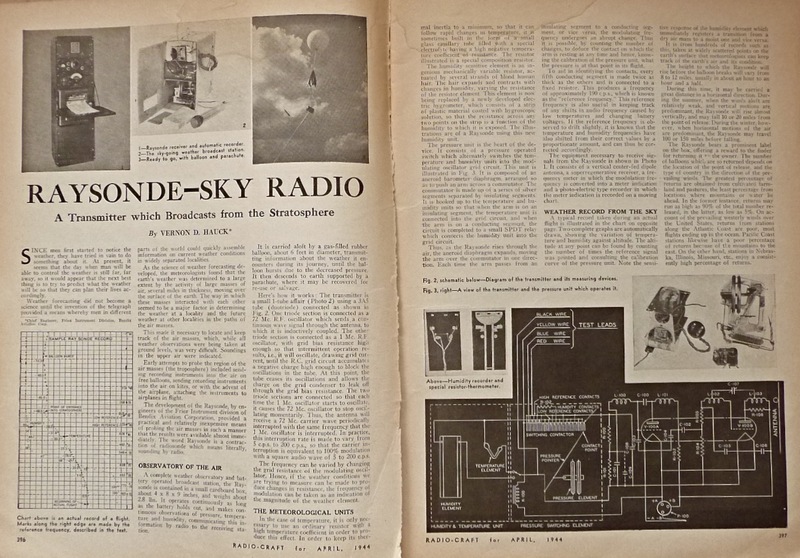 1936 January 1 Les Ailes "Les Ballons Radio-Sondes" 4 Article with photos and stratosphere/tropopause diagram, subtitled "A Beautiful French Invention"
1937 August Popular Aviation “The Radio-Meteorograph Broadcasts its Readings” S. R. Winters 24 Article with photos and schematic of Bureau of Standards radio-meteorograph. 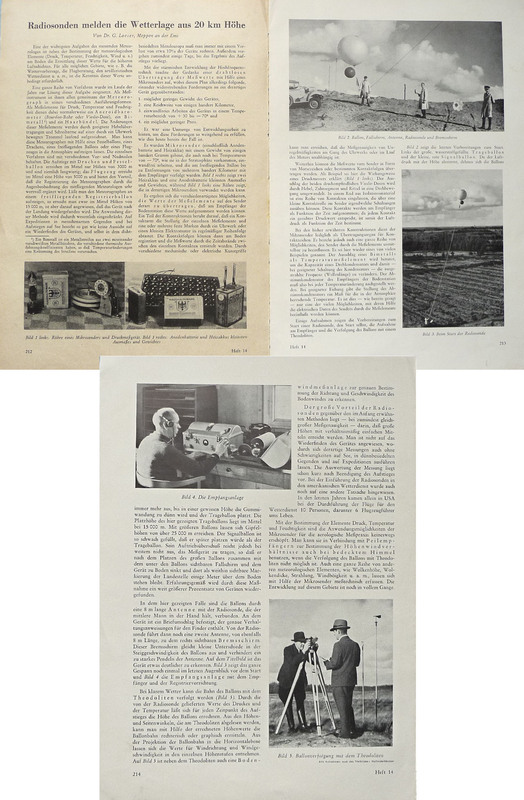 1937 January 18 Life “A Radiometeorograph Goes Up 20 Miles” 41 Article with photos about the radiometeorograph. 1937 June Short Wave and Television (Hugo Gernsback, ed.) 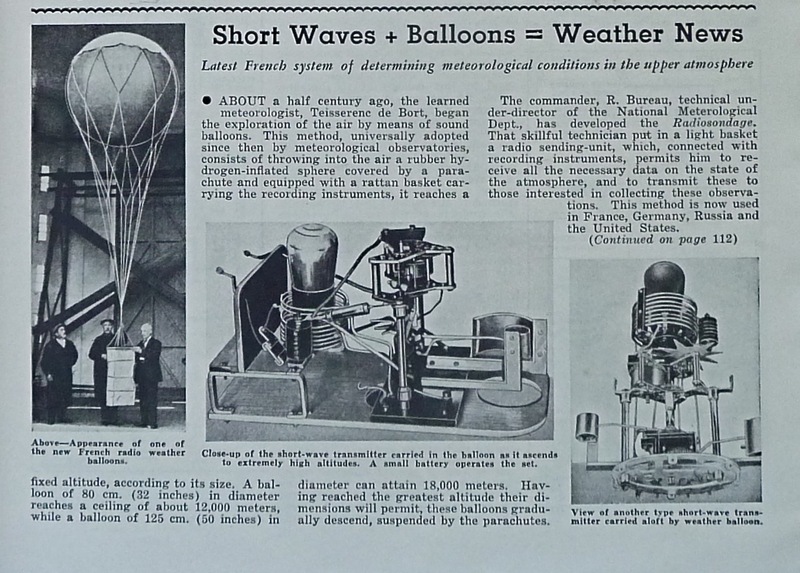 “Short waves + Balloons = Weather News” 71 Article with photos. 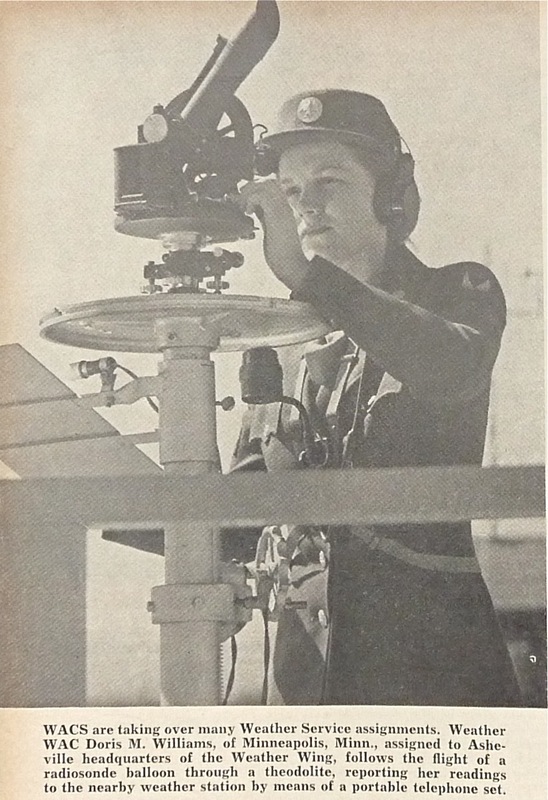 1938 January-March The Signal Corps Bulletin “Radio-Meteorograph Station W1XFW” Dr. C. F. Brooks 40-48 Excellent illustrated history of Harvard’s radio-meteorograph development efforts by Director of the Blue Hill Observatory. 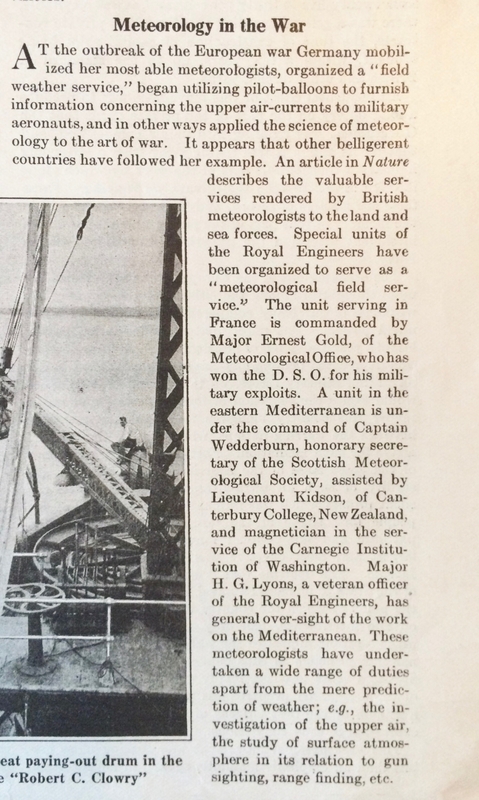 1939 February 18 Science News Letter Upper Air Data Will Aid in Forecasting the Weather" Comdr. Francis W. Reichelderfer 103 Discusses the "radio-sonde" the "newest method" of upper-air soundings. Notes 6 Weather Bureau, 2 Army, and 2 Navy radiosonde stations. 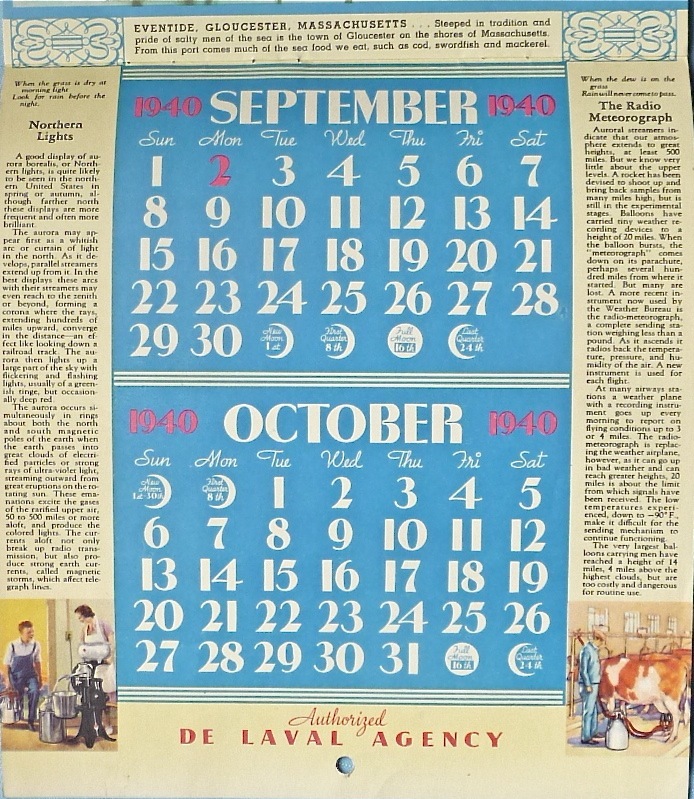 1940 Calendar, De Laval Cream Separators “The Radiometeorograph” Sept-Oct Sidebar. 1940 April Fortune “The Weather” 58 Illustrated article on the relationship of weather to business. 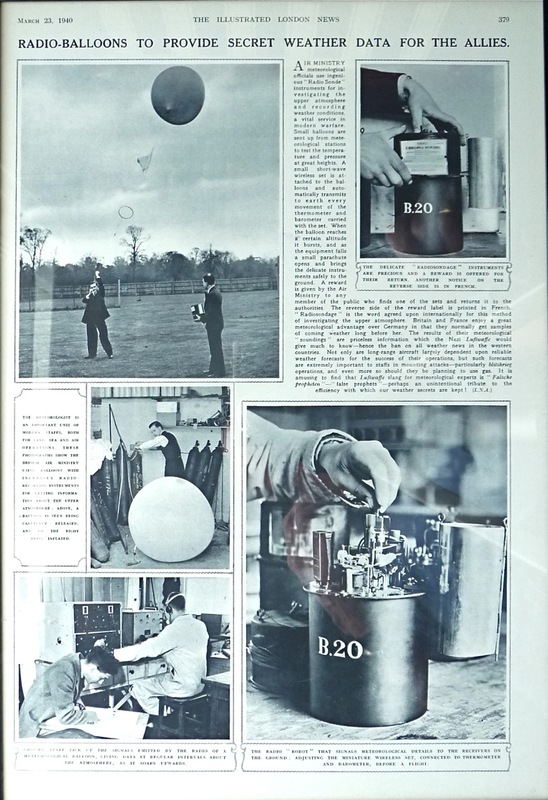 1940 March 23 The Illustrated London News “Radio-Balloons to Provide Secret Weather Data for the Allies” 379 Well photographed article of British Air Ministry B. 20 radiosonde and launch. 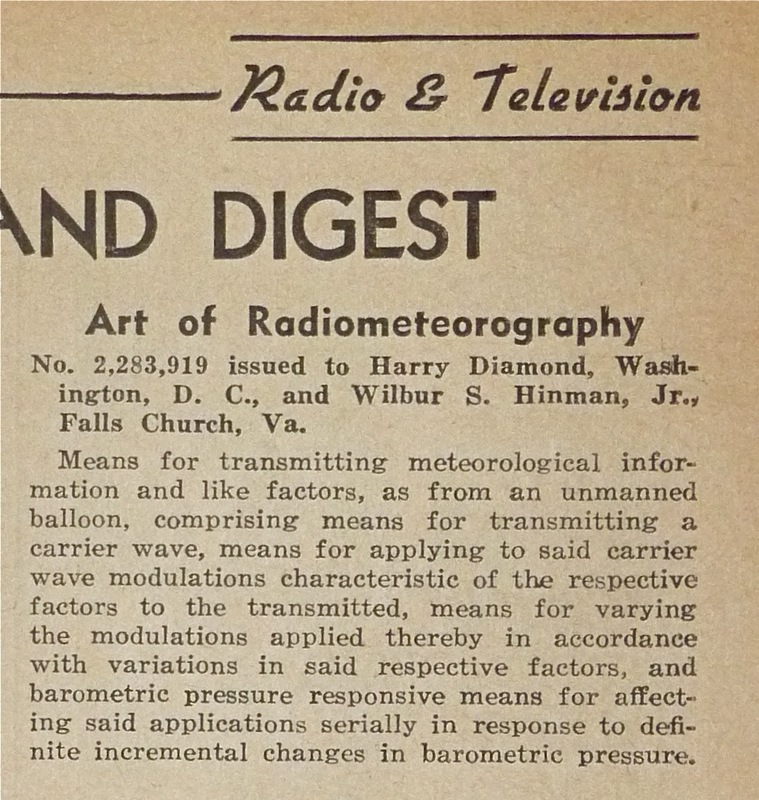 1940 October The Bulletin of the American Meteorological Society “An Improved Radiosonde and its Performance” Harry Diamond; W. S. Hinman, Jr.; F. W. Dunmore; and E. G. Lapham 325 Discussion of the Diamond-Hinman Navy radiosonde. 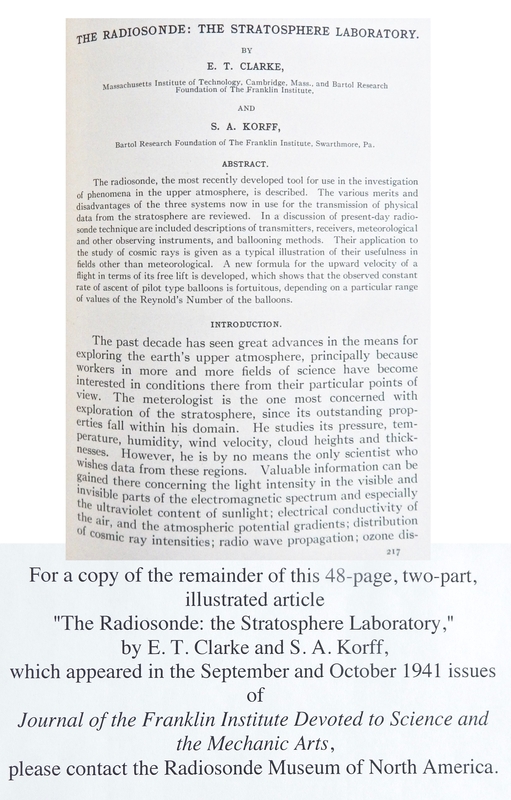 1941 Journal of the Franklin Institute "The Radiosonde: the Stratosphere Laboratory" E. T. Clarke and S. A. Korff 217 Discusses technical aspects of radiosondes, pros and cons of three common systems, and non-meteorological applications. 1941 (?) Heft 14 (?) 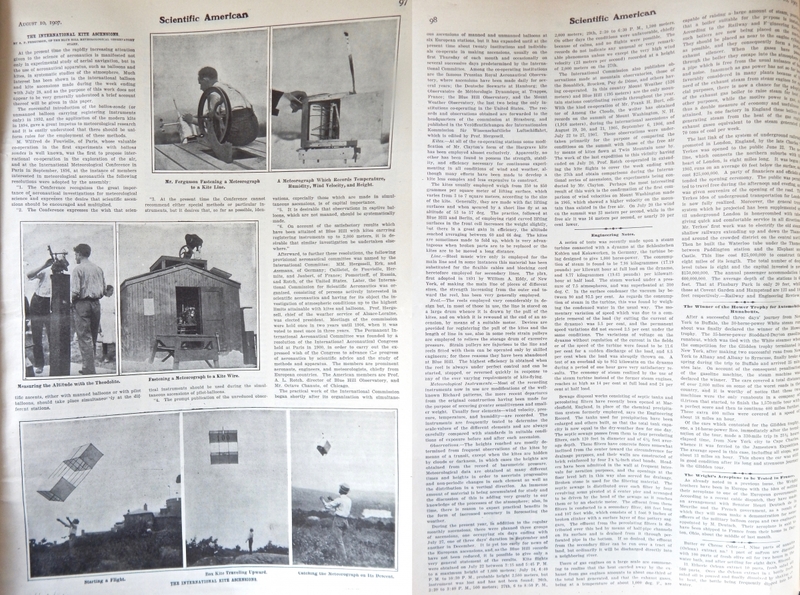 “Radiosonden melden die Wetterlage aus 20 km Hohe” Von Dr. G. Loeser 212 Clip from WWII German magazine, with photos. 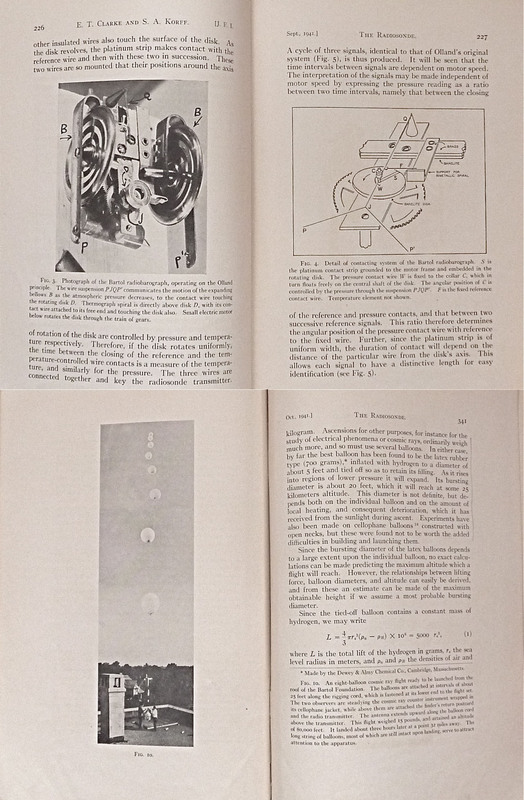 1941 September & October Journal of the Franklin Institute “The Radiosonde: The Stratosphere Laboratory” E. T. Clarke and S. A. Korff – Contemporary reprint of two companion articles with photos, diagrams, and schematics, extensive bibliography. 1942 July Radio-Craft (Hugo Gernsback, ed.) “Art of Radiometeorography” 699 Notice of Diamond and Hinman patent. 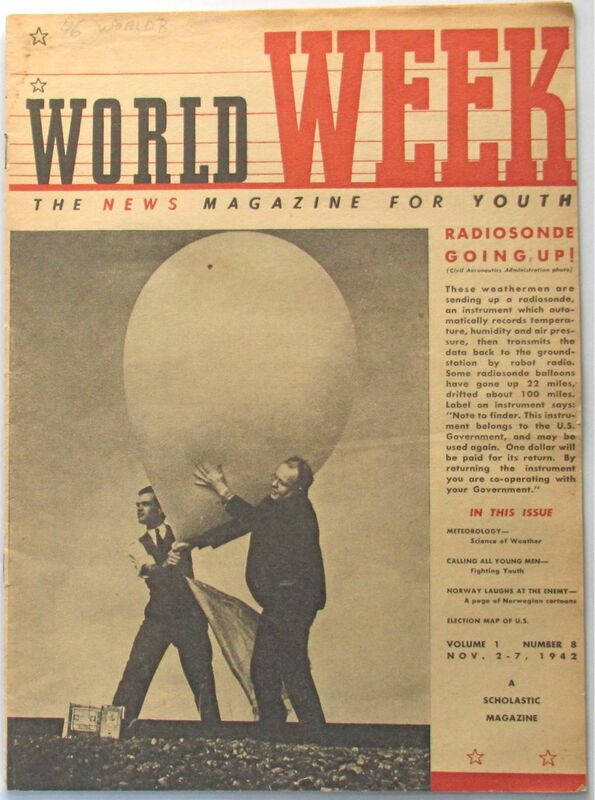 1942 November World Week “Radiosonde Going Up!” Cover Also an article “The Science of Weather” describing radiosondes on p. 18. 1942 October Radio News “The Radio Sonde” Willard Moody 36 Description of the Diamond-Hinman (Bureau of Standards) Navy radiosonde. 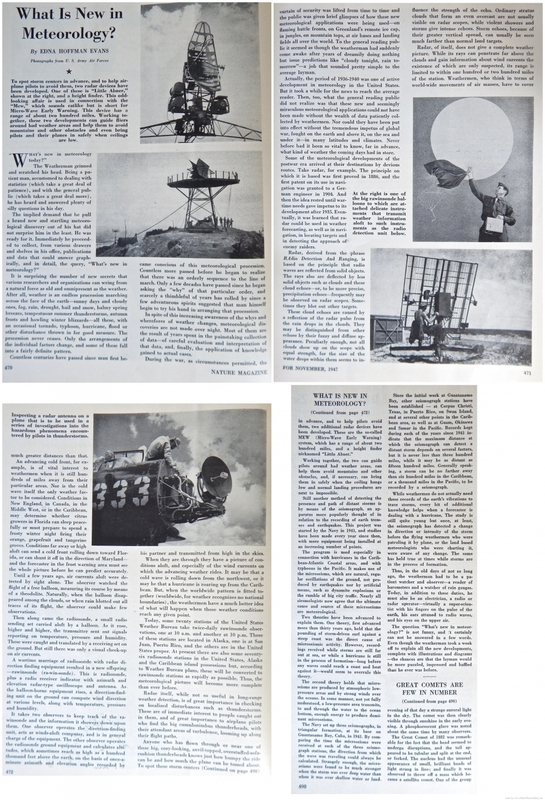 1942 October 16 Current Aviation “Clouds, Moisture, and the Upper Air” 36 Article with radiosonde photos. 1943 August Electronic Industries “Tubes in Meteorology” G. Sonbergh 62 Color cover shot of radiosonde launch, couple of photos, little text about radiosondes. 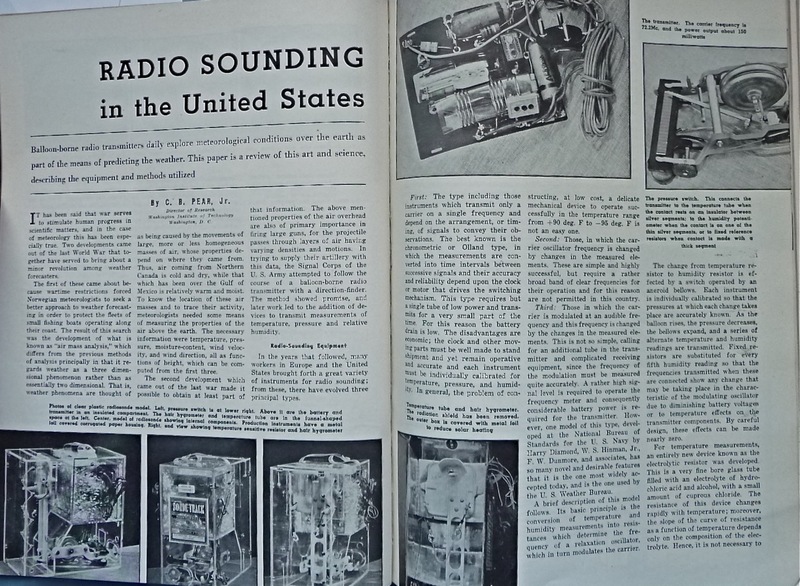 1943 January Electronics “Radio Sounding in the United States” C. B. Pear, Jr. Radio sounding overview article with photos, maps, and diagrams. 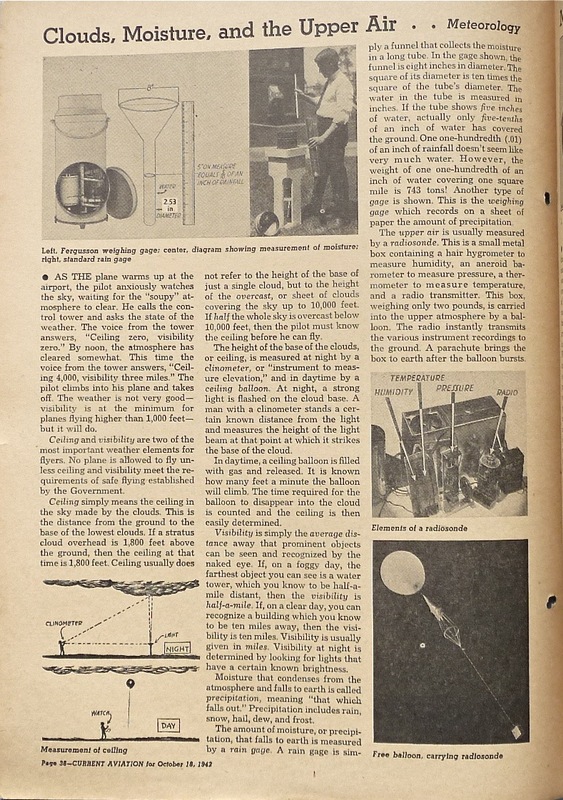 1943 May Electrical World “Linemen Cautioned About Disengaging Radiosondes” 62 Relates details of a fatality caused by a radiosonde entangled in power lines. 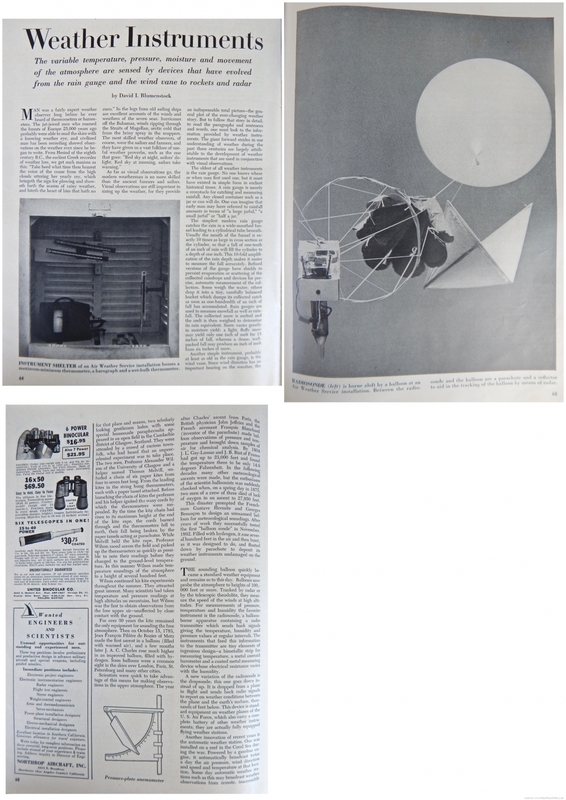 1943 September 13 Life “Meteorology” 102 Article with photos about radiosondes. 1944? Capt. 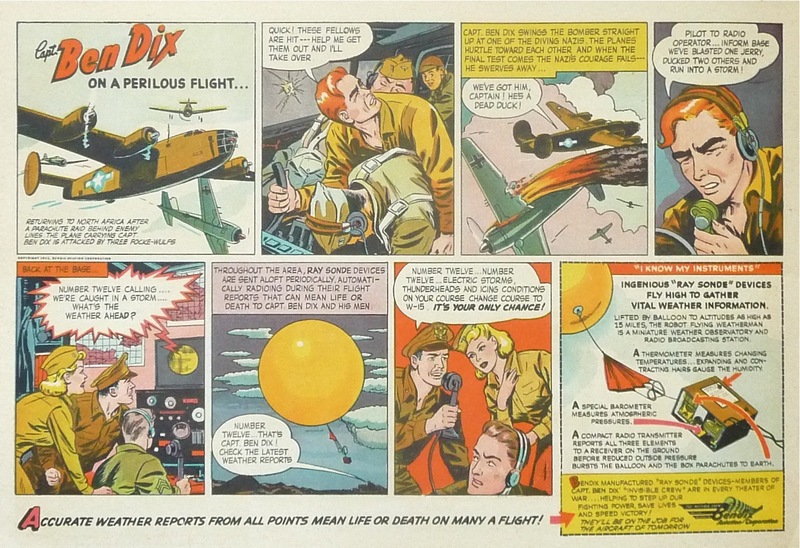 Ben Dix (Bendix comic book) “Secrets of the Invisible Crew” 207 Standard comic format, description of Raysonde and recorder. 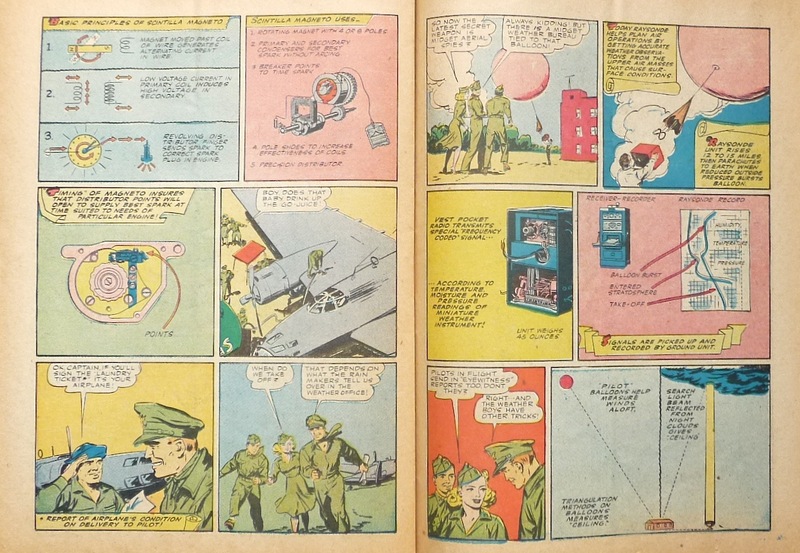 1944 April Radio-Craft (Hugo Gernsback, ed.) 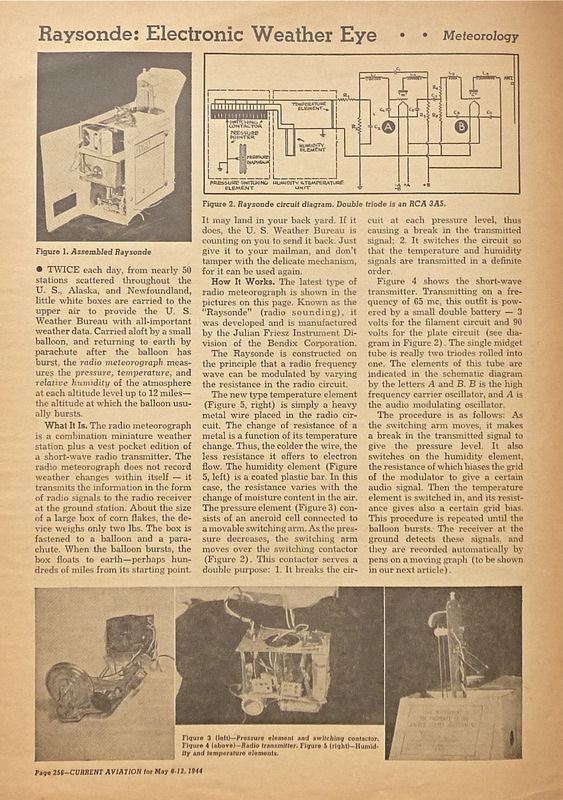 “Raysonde—Sky Radio” Vernon D. Hauck 396 Article with photos and schematic of Freize Raysonde. 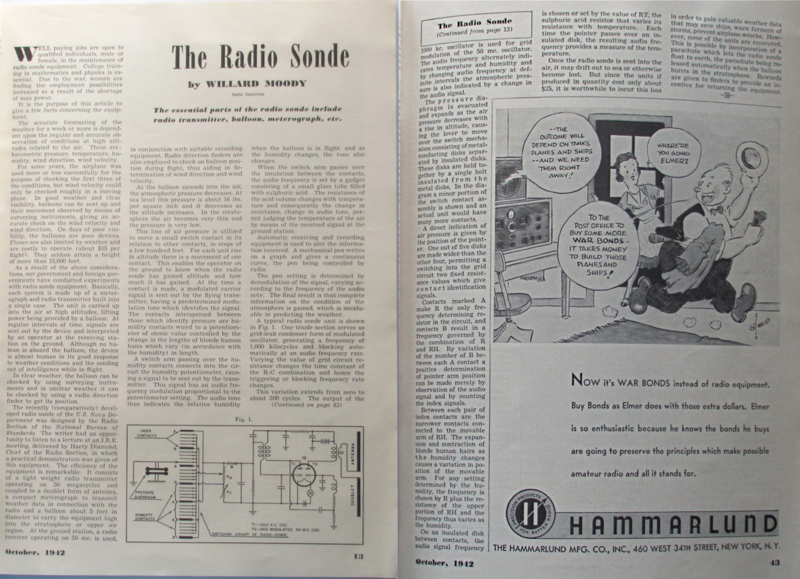 1944 February Radio News “Radiosonde” 207 Article with photos (notes advantage of blonde hairs in hygrometers). 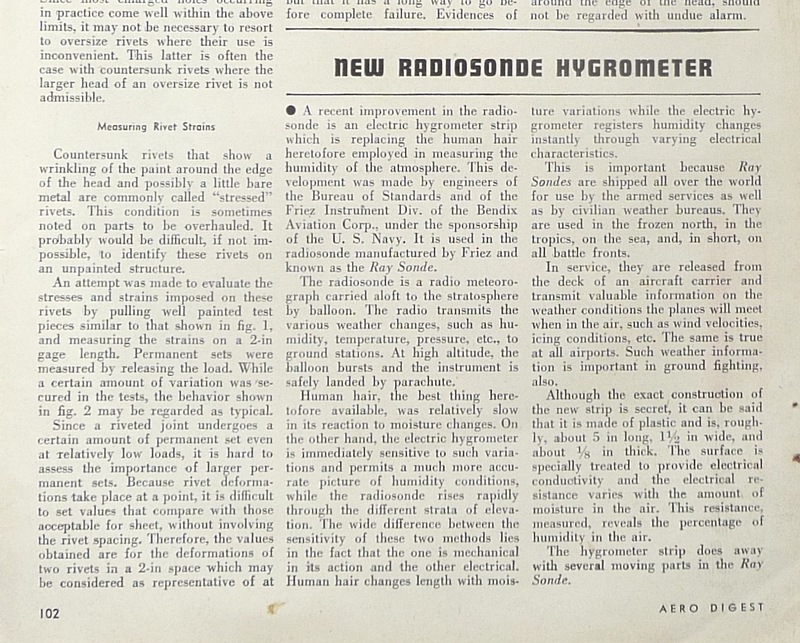 1944 July 1 Aero Digest “New Radiosonde Hygrometer” 102 Article on Raysonde’s replacement for the human hair hygrometer. 1944 June 10 The State (North Carolina) “They Give the News About Weather” 1 Article about Army Air Forces Weather Wing with photo of WAC tracking radiosonde. 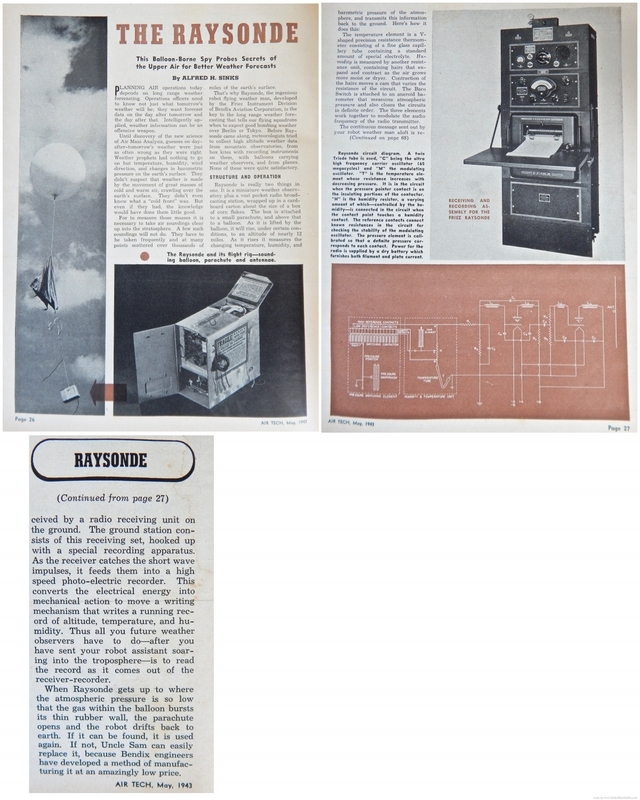 1944 May 8-12 Current Aviation “Raysonde: Electronic Weather Eye” 256 Article with photos and schematic on Bendix/Frieze Raysonde. 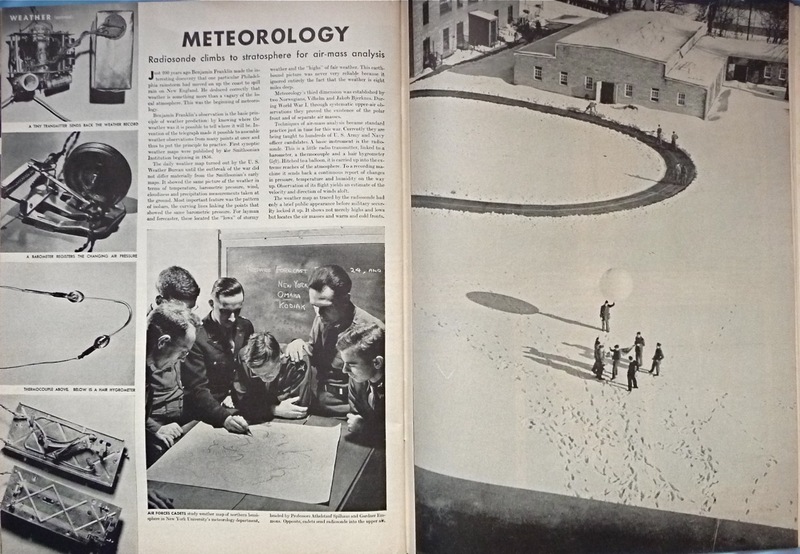 1946 February Popular Mechanics Magazine “Science Pins Down the Weather” Andrew J. Hamilton 40 Article with photos. 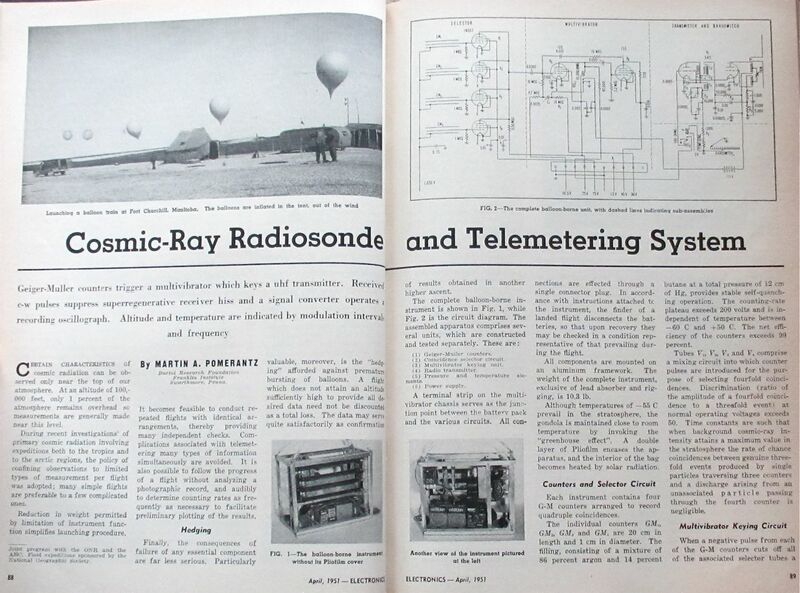 1946 May Electronics “Radiosonde Telemetering System”Hauck, Cosby, Dember 120 Article with photos. 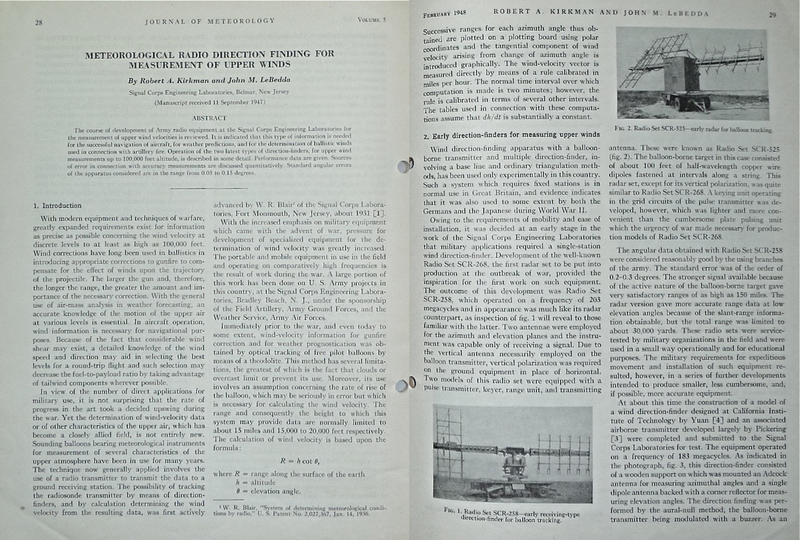 1946 November Proceedings of the Institute of Radio Engineers and Waves and Electrons “Ultra-High Frequency Radio Direction Finding” Luke Chia-Liu Yuan 852 Direction finder operating at 183 megacycles for observing meteorological balloon flights. 1947 Al-Mussawar “King Farouk of Egypt and Radiosonde” ? 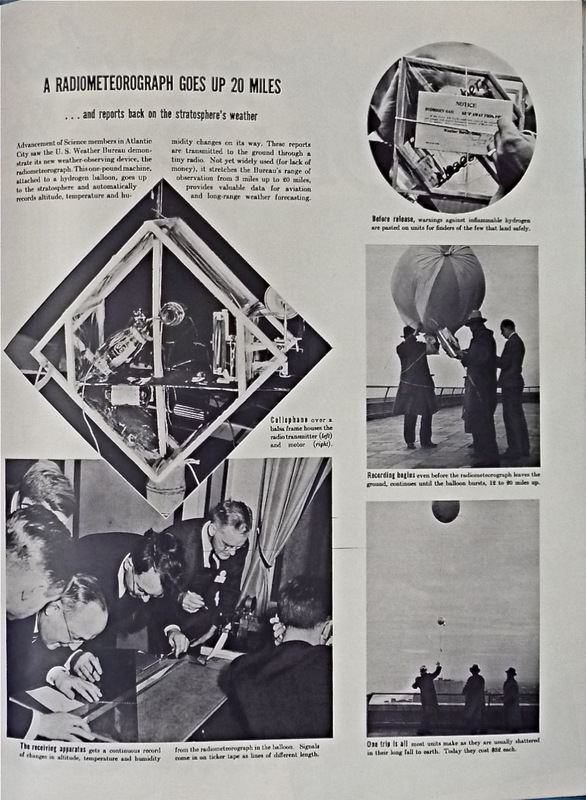 Photo spread of King Farouk with balloon, radiosonde, and recorder. 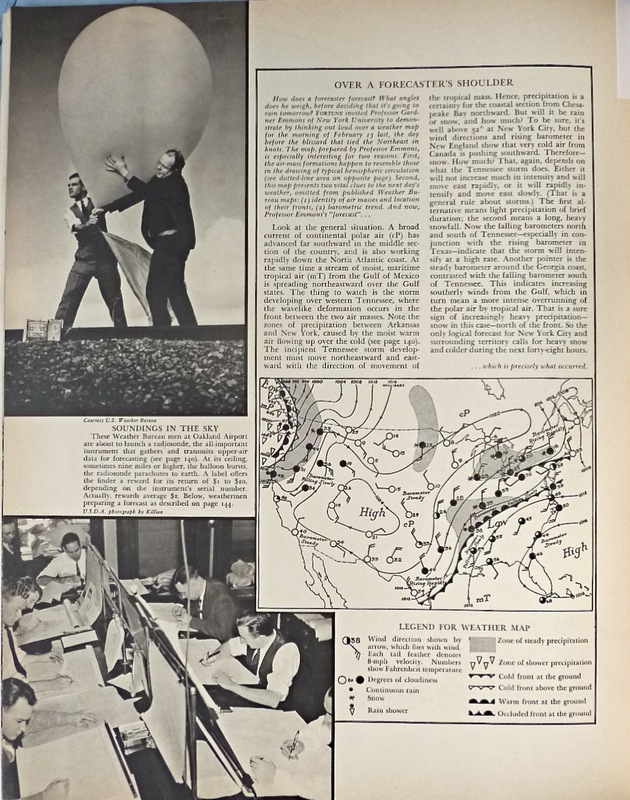 1947 Nature Magazine “What Is New in Meteorology?” Edna Hoffman Evans 470-472, 498 Describes WWII addition of radar tracking capability for radiosondes to create rawinsondes. 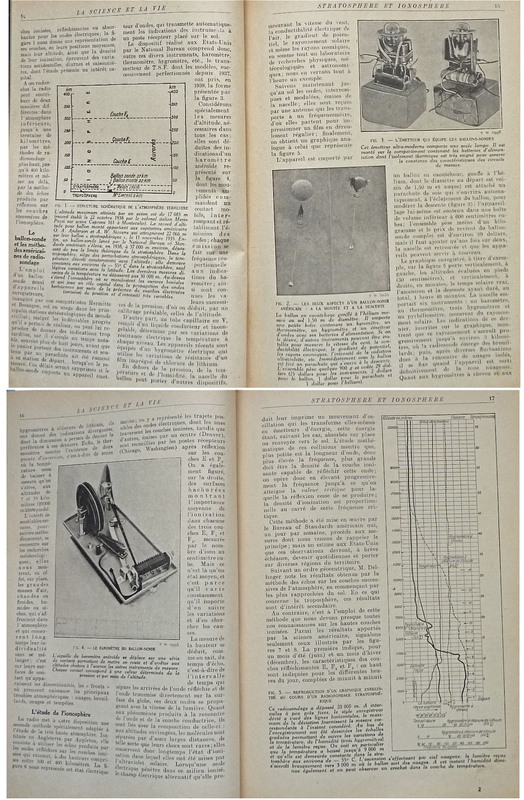 1948 April Weather The Applications of Radiosondes to Meteorology" O. M. Ashford 103 Discussion of accuracy of radiosondes and improvements in design. 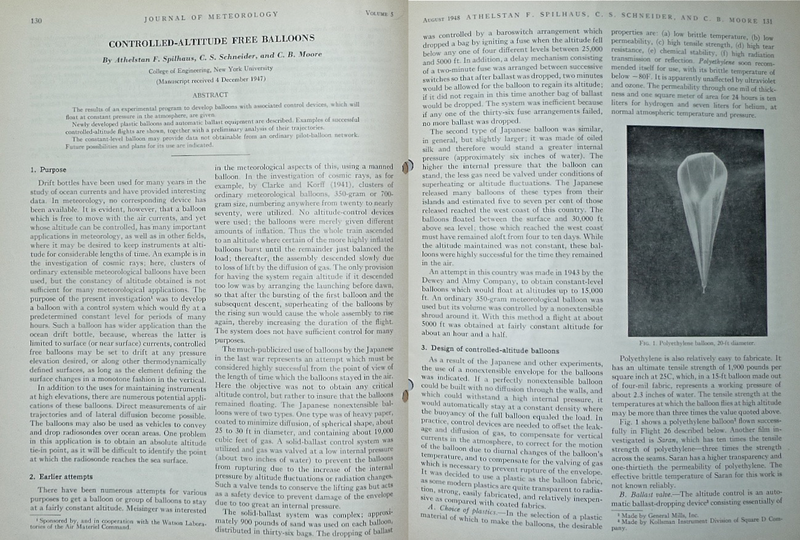 1948 August Journal of Meteorology “Controlled-Altitude Free Balloons” Athelstan F. Spilhaus, C. S. Schneider, and C. B. Moore 130 With photos, sketches, and graphs of proposed methods. 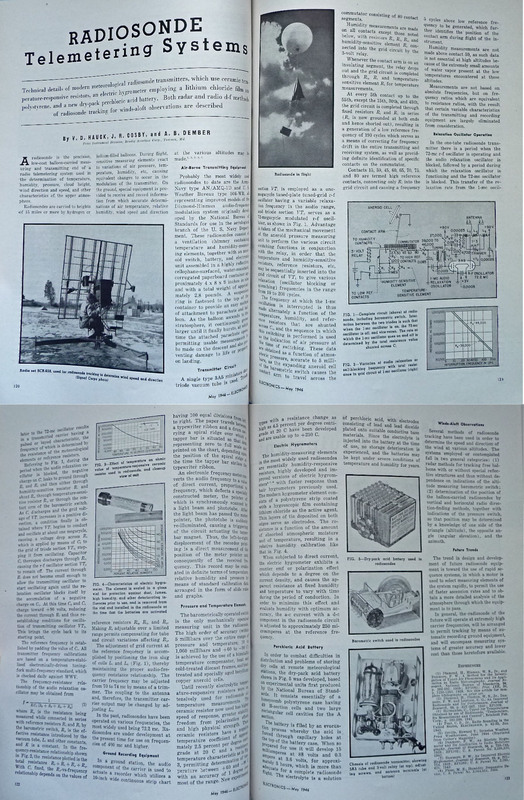 1948 February Journal of Meteorology “Meteorological Radio Direction Finding for Measurement of Upper Winds ” Robert A. Kirkman & John M. Lebedda 28 With photos and block diagrams of various radar systems. 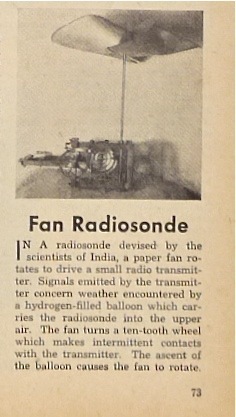 1949 August Science and Mechanics “Fan Radiosonde” 73 Short piece on radiosonde with paper fan from India. 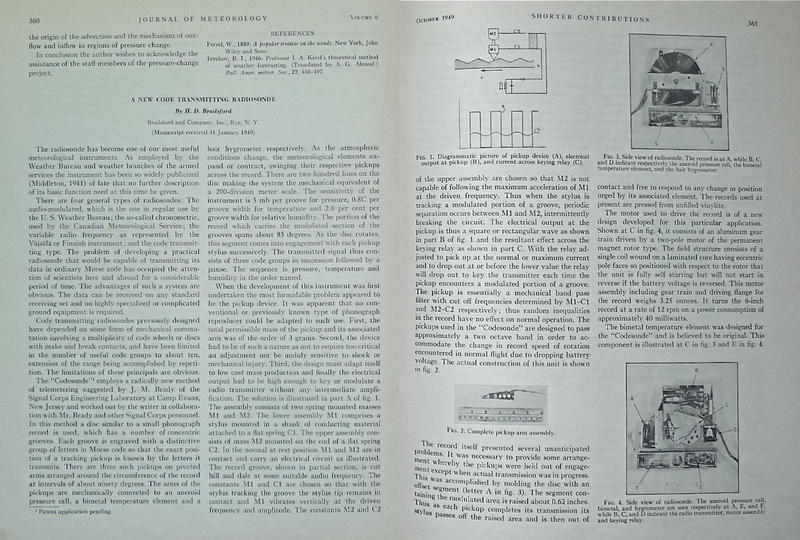 1949 October Journal of Meteorology “A New Code Transmitting Radiosonde” H. D. Brailsford 360 Photos and diagrams of a Morse Code “Codesonde” device. 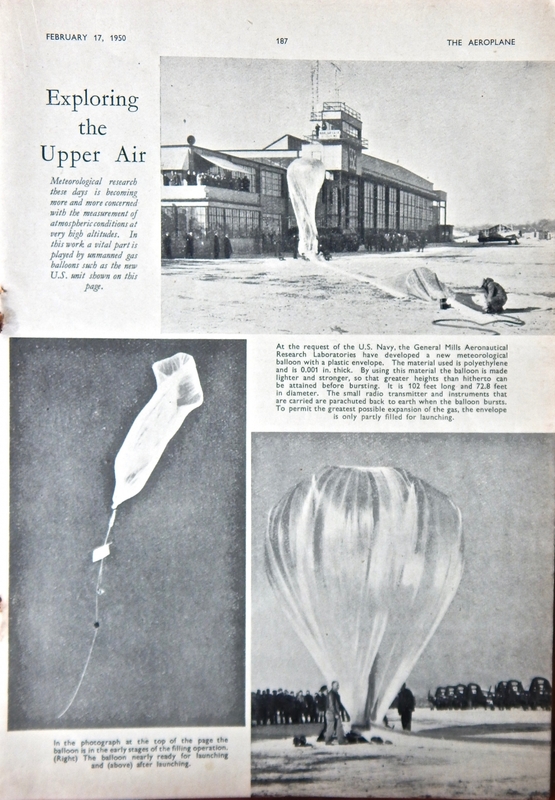 1950 The Aeroplane “Exploring the Upper Air” 187 Describes a new Navy balloon developed by General Mills Aeronautical Research Laboratories for very-high-altitude meteorological observations. 1951 The Polar Record Vol. 6 No. 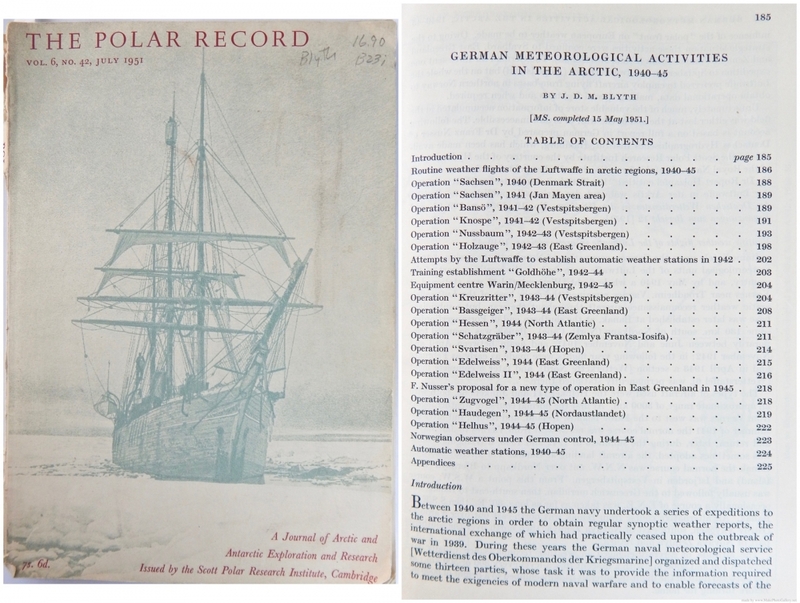 42 “German Meteorological Activities in the Arctic, 1940-45" J. D. M. Blyth 185-226 Forty-one-page article notes logistical difficulties of “radio-sonde” observations. 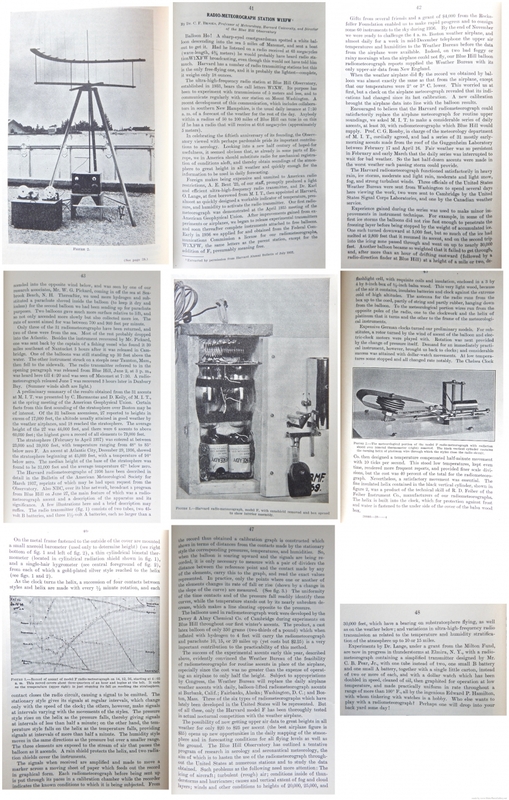 1951 April “Electronics” “Cosmic-Ray Radiosondes and Telemetering System,” Martin A. Pomerantz 88 Photographs and schematics of cosmic-ray exploration project. 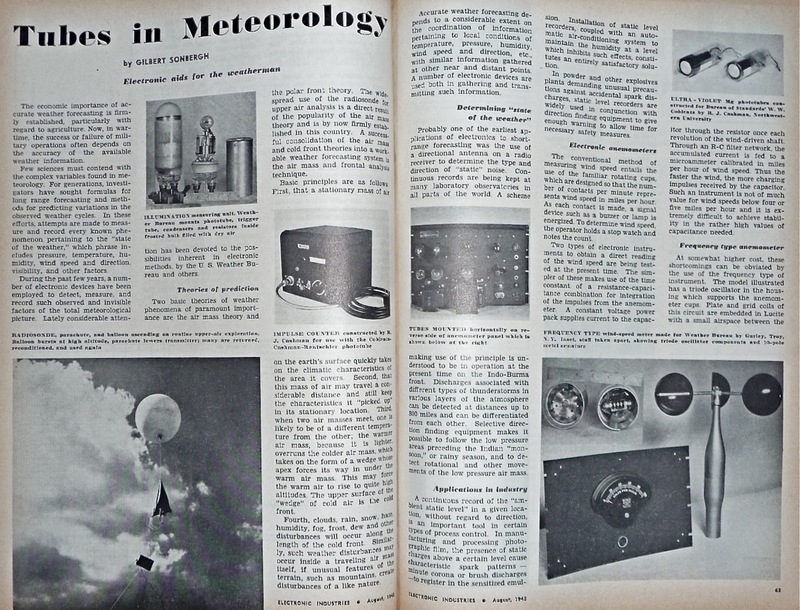 1951 December Scientific American “Weather Instruments” David I. Blumenstock 64-70 Summary history of instruments used to measure temperature, pressure, humidity, and air movement—selected pages. 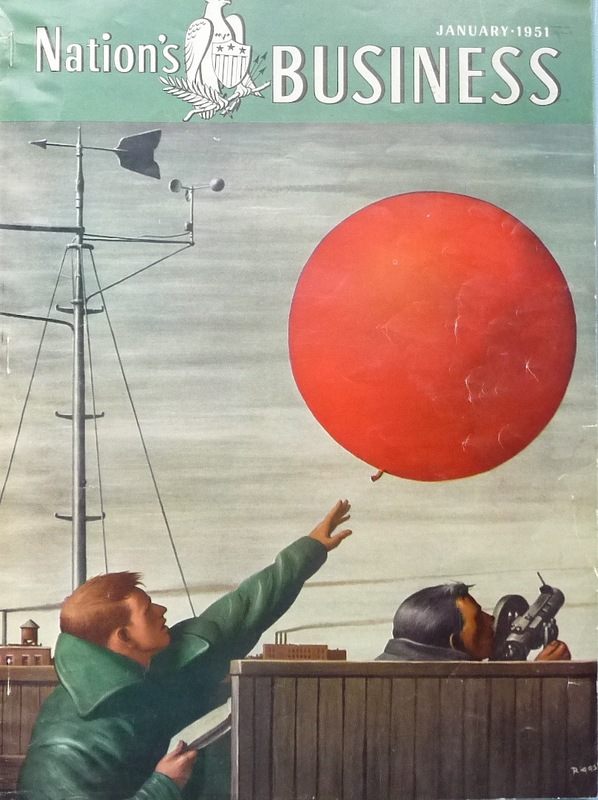 1951 January Nation’s Business Cover Cover Nice Robert Riggs painting of a USWB pilot balloon launch. Description on p. 8. 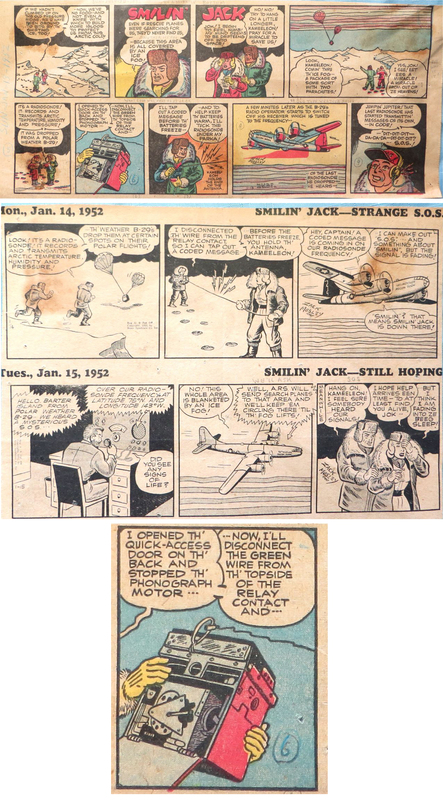 1952 January 13-15 Chicago Tribune "Smilin' Jack" Zack Mosley ? A radiosonde saves the day for Jack and Kameeleon. See also 1972 entry below. 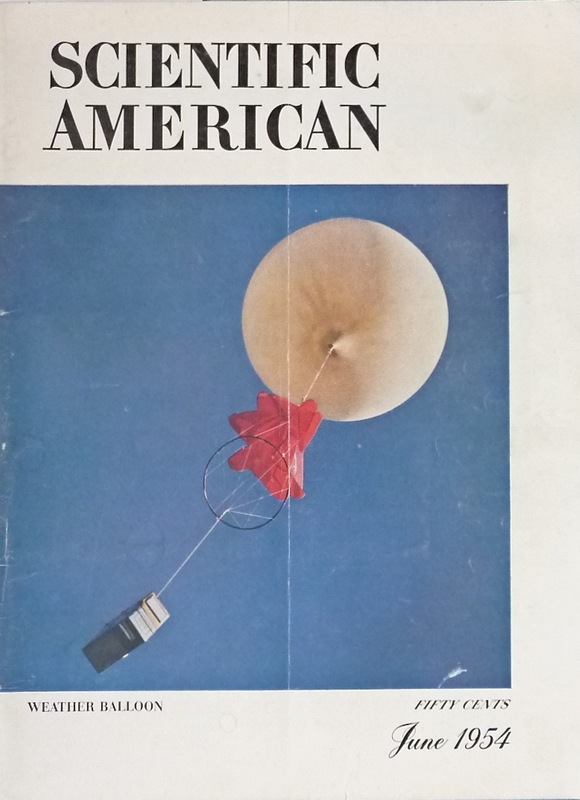 1954 June Scientific American “Hurricanes” R. H. Simpson 32 Color cover shot of radiosonde, brief description of radiosondes on p. 24. 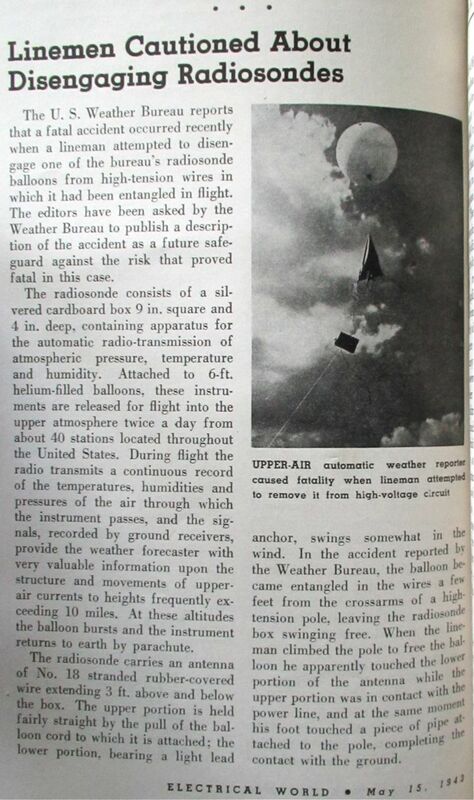 1956 Summer The [London] Times, Science Review “Weather Balloon Ascents” R.C. Sutcliffe 5 Survey of weather balloon usage including U.S. "Skyhooks." 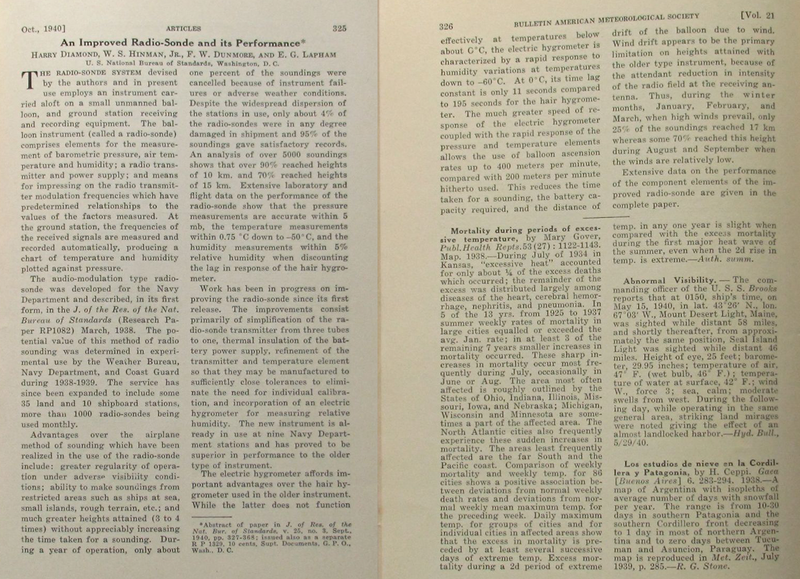 1958 August & July The Royal Society “UK Antarctic Report for the International Geophysical Year” (excerpts) 4, 7; 4, 6, 10 Report, with photos of Brewer ozonesonde experiments. 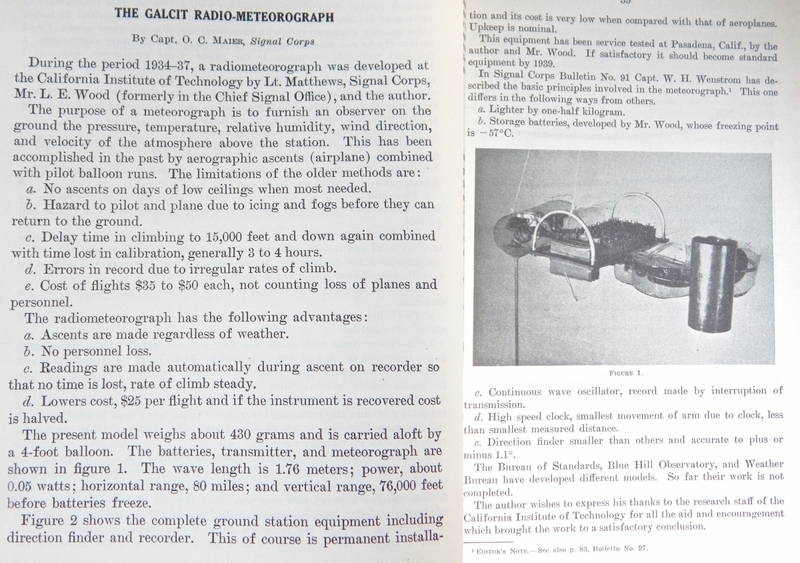 1959 November Journal of Geophysical Research “ Application of Meteorological Rocket Systems,” Willis L. Webb and Kenneth R. Jenkins 1855 Examines issues associated with the use of rockets to obtain real-time meteorological data at altitudes from the surface to 200,000 feet. 1967 Summer NCAR Quarterly Horizontal Sounding Balloons" and "Balloons Against Ice," staff 1 Tracing large-scale air movements by horizontal soundings; includes Global Horizontal Sounding Technique (GHOST) balloons, cannibal-loons, Transosonde balloons, Sky-anchors, etc. 1971 Flash (DC Comics) Flash Facts 30 1971 reprint of 1959 1st series DC. 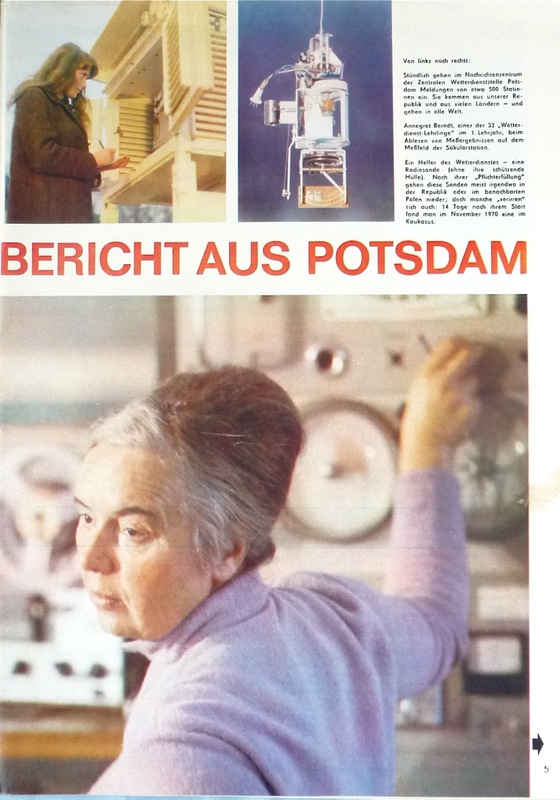 1971 January 4 FF Dabei “Und taglich: Der Wetterbericht aus Potsdam” 4 Article in German with color photos. 1972 July 31-August 4 Chicago Tribune "Smilin' Jack" Zack Mosley ? A radiosonde saves the day for Jack and Sizzle. See also 1952 entry above. 1973 (Vol. 3) Promet Meteorologische Fortbildung "Prüffeld und mebobjekt für radiosonden" M. Hinzpeter 10 In German, technical article with diagrams and equations. 1978 December Popular Science “Atmospheric Snooper” 18 Brief article with photos of AIR Inc. Airsonde. 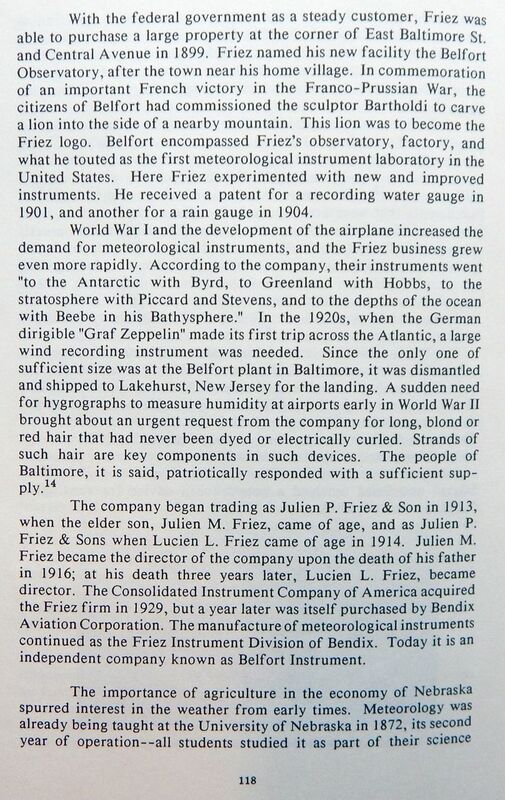 1994 Rittenhouse "Julien P. Friez: An Important American Meteorlogical Instrument Maker" Ten-Page article on Friez, father of Julien M., discussing, inter alia, his early hydrographs. 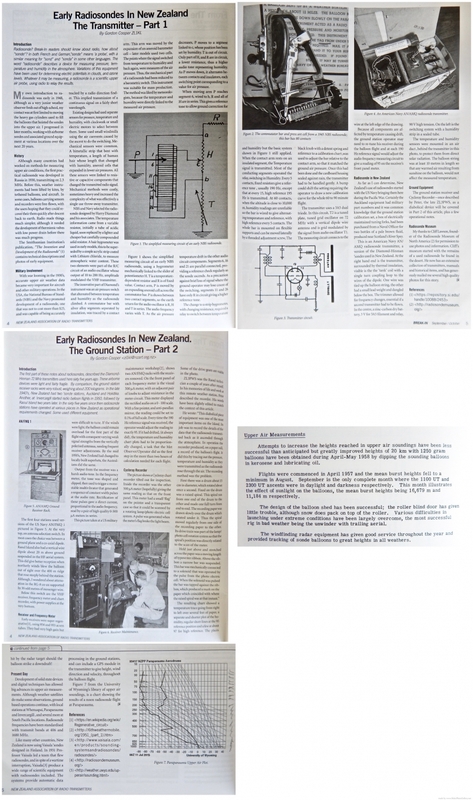 1995 December Short Wave Magazine “Radiosondes” Philip C. Mitchell 32 Article with photos and diagrams focusing on the Vaisala RS 80-15N. 1999 February/March. 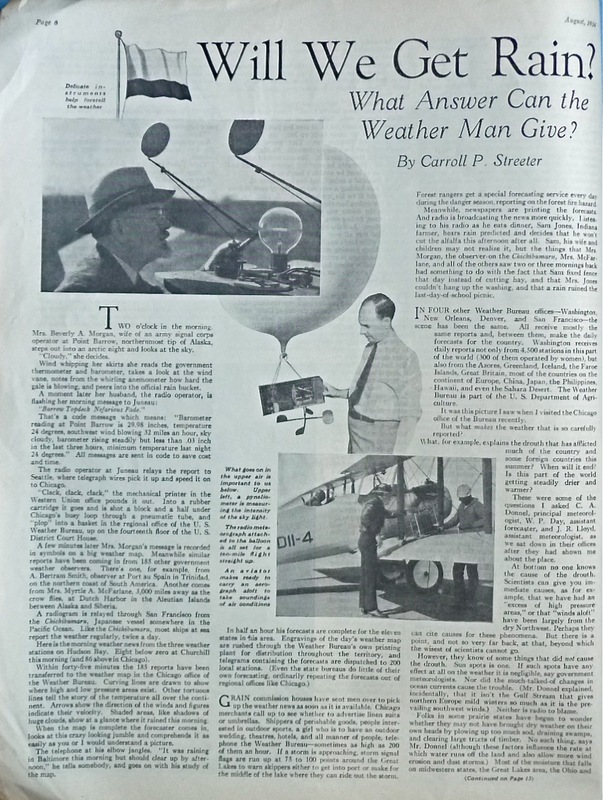 Air & Space Smithsonian “How’s the Weather Up There?” Phil Scott 74 Illustrated article on the current use of radiosondes. 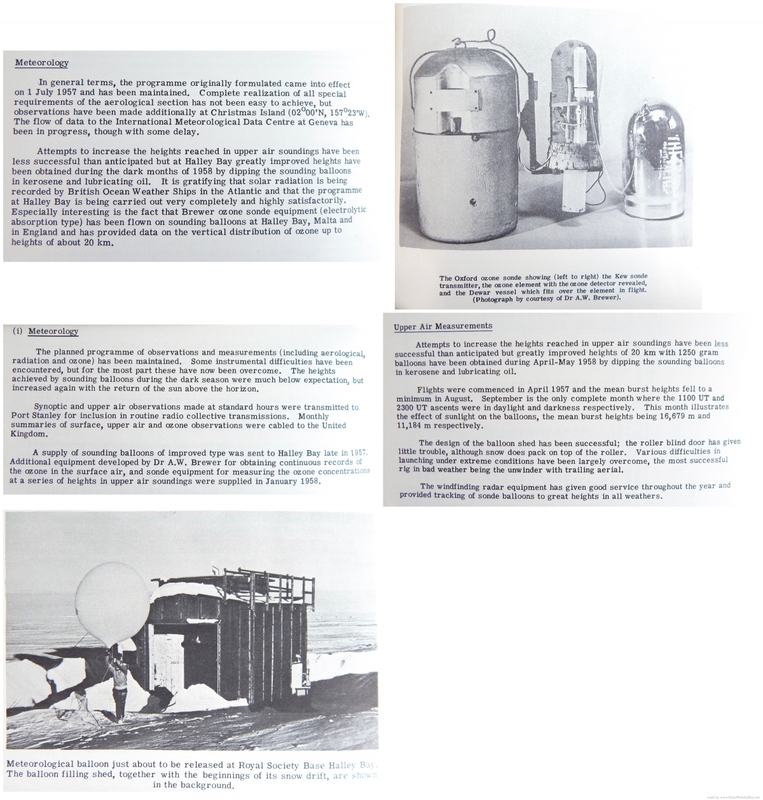 2005 July The AWA Journal “World War II Radiosonde Systems” Leon Hillman 41 Article with photos.